It’s always lovely to read a book that you really enjoy and then discover that the author has already written quite a few others. 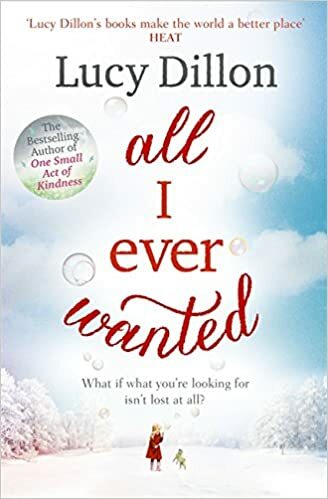 All I Ever Wanted by Lucy Dillon is one of these books. Caitlan and Patrick used to seem perfect for each other but now work comes first for Patrick and they argue all the time. When he moves out to start work in another city, their four year old daughter Nancy stops talking. As the family begins to readjust to their new domestic circumstances, the Nancy and her older brother Joel spend alternate weekends with their widowed Aunt Eva, who they have barely met before. Eva’s husband was a famous actor, several years older than her, and had been married twice before. Eva has recently found out that Mick left diaries including details of his marriages. As she reads them with a view to publication, she begins to discover that perhaps there was a lot about her husband she didn’t know. Meanwhile, Caitlan and Patrick try to work out how they will parent the children and move on with their lives. This was such a lovely book and the way Lucy Dillon has written about her characters made me want to keep reading to find out how things would work out for them. How could things have gone so wrong between Caitlan and Patrick when they had been so much in love? I could really understand their concern for Nancy when she stopped speaking and their two different approaches summed up their characters. Patrick, ever practical, thinks making some phone calls to arrange appointments with medical professionals will get to the bottom of it quickly. Caitlan, however, just wants Nancy to feel safe and surround her with love and encouragement to get her to speak again. Surprisingly, the characters Nancy can talk to are not human but Eva’s two pugs Bumble and Bee. Now I’m not a dog-lover but even I thought they were brilliant additions to the book. I felt that Lucy Dillon really captured the emotions of her characters. The turmoil and unhappiness felt by so many of them as they tried to come to terms with their changing circumstances was beautifully conveyed. I was there with Eva as she felt hurt and confused by what she found out about Mick while also still feeling so much love for him. I could understand Caitlan’s worry and guilt over what the break-up of her marriage was doing to her children. And I had to smile at Joel who sang and danced his way through most of the book yet was still deeply affected by what was happening to his family. I really enjoyed this book and found it a really compelling read. Despite all the worry and upset in the family it is ultimately an uplifting novel. It’s beautifully written, captivating, full of love and warmth. It definitely won’t be the last Lucy Dillon book I read. Enjoy reading your reviews. It makes me want to read more books though!